A Partner provides financial tuition assistance of $2,000 per year as well as mentoring for a matched student for 4 years at a college preparatory high school in the greater Newark/Jersey city area. A Partner is a concerned individual who is willing to make a four-year commitment of $2000 per year to provide a scholarship to help provide a private school education to an under-served, inner-city student and mentors his/her supported student. 100% of Partner contributions go toward their student’s tuition. Individuals becoming Partners are provided with mentor training, mentor resources and support from the Student/Partner Alliance staff. Throughout the academic year events are organized to bring Partners together with their students in a group setting. A Mentor provides mentoring support only for a matched student for 4 years at a college preparatory high school in the greater Newark/Jersey City area. A Mentor is a trusted and experienced individual who wishes to provide coaching and advice to a student. No financial support is expected. Mentors are sometimes S/PA alumni who wish to give back by providing the guidance they were given as a S/PA student. Individuals becoming Mentors will be provided with mentor training, mentor resources and support from the Student/Partner Alliance staff. Throughout the academic year events are held to bring Mentors together with their students in a group setting. A Sponsor provides financial support of at least $2000 per year for a matched student for 4 years at a college preparatory high school in the greater Newark/Jersey City area. A Sponsor is an individual, corporation or foundation that wishes to support low-income, students from urban areas who seek a strong college preparatory education that will enable them to be accepted into and then thrive in college. Sponsors are invited and welcome to attend S/PA-organized events and are able to meet their supported students if they wish. Sponsors are not expected to provide mentoring or maintain contact with the student they are sponsoring. Sponsors receive regular progress reports (report cards), which indicate their student’s academic progress. Student/Partner Alliance staff is available to answer any questions or concerns regarding a sponsor’s student. The Young Professionals Network (YPN) is a group of young professionals from the NY/NJ area who provide support to the Student/Partner Alliance by mentoring students and organizing casual, fun social events. The events are an opportunity for young professionals to socialize, network, and support a great cause in the process. YPN also serves as an opportunity for current mentors to introduce S/PA to potential new mentors, while sharing the great story of S/PA and its students. Reitz events started in December of 1982, when Bunk (Bruce Reitz) and Susan, his wife, along with several of their friends, decided to get some exercise and jump into the holiday spirit by donning Bunk’s Fun Run Christmas t-shirts, running around Brookdale Park, and finishing up with holiday food and grog. Needless to say, a great time was had by all! The next day, one friend suggested that they collect money and donate the proceeds to a local charity as part of the holiday season. Thus, a tradition was born. In 1997, Bunk and Susan learned of an organization called Student/Partner Alliance that provided scholarships for financially disadvantaged inner city students in nearby Newark. Bunk called S/PA, he and Susan liked the mission and S/PA became Bunk’s Fun Run’s charity. In addition, Bunk started mentoring students. At the urging of their nephew Connor Fee to create a midyear fundraiser for more scholarships, Bunk’s Golf was born in 2007. This has grown over the years from 27 to over 125 golfers! 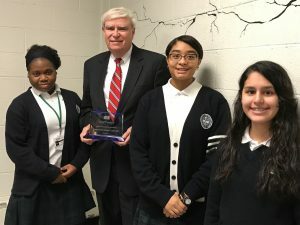 Since 2000, Bruce and his wife have personally mentored over 20 students and their events have supported over 100 scholarships, now for students at Montclair’s Immaculate Conception High School, where Bruce joined the Board. 100% of the funds from Reitz events go to support scholarships. You can support Reitz Events, by registering for the annual golf event, sponsoring the event or providing items for the Auction. Please contact: unclebok50@gmail.com for more information. For over 25 years, our program has stood out for its unique combination of mentoring and tuition assistance for urban high school students in northern New Jersey. 99% of our students graduate from high school and are accepted into college, thereby providing a critical step towards breaking the cycle of poverty. YOU can make a difference by supporting a student.